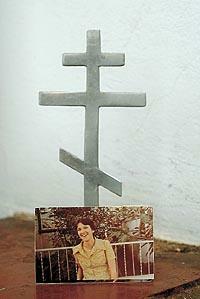 Maria Aparecida Berushko (or Beruski) was a school teacher who died saving her students in a school fire in Brazil. 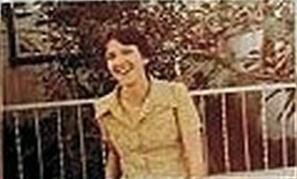 Maria, being of Ukrainian descent and an Orthodox Christian, was born in 1959, in Joaquim Távora, Paraná, Brazil. When a school caught fire on April 4th in 1986, Maria refused a chance to leave the building, instead she stayed inside and assisted her pupils in escaping. Berushko assisted in saving the lives of five children, but eight children died together with the teacher in the fire. Maria is popularly known as "the Martyr of Joaquim Távora." She became locally venerated as a saint shortly after the incident, not only for her supreme sacrifice of love, but also for the miracles that began to be reported through her intercessions at her grave. The day after the incident, it was headline news throughout Brazil. It was determined that the fire began with the explosion of a gas canister, which was used in a stove, positioned in the only door of the school, where the teacher herself made the soup for the children's snack. "The school was like a hall. Suddenly, the canister exploded and the flames spread very quickly. The heat was unbearable. I was a very light kid and I was able to walk out a small window. Outside, I pulled out other students. But unfortunately, not all of them managed to flee," recalls farmer Celso Leonel Carvalho. At the time, he was twelve years old and was the first of five children to be saved. Today, he works in a rural estate, which is a few meters from where he was at the school and remembers the sad scenes of the accident. The incident caused a commotion in the town of Joaquim Távora for a long time after the tragedy. The family of Maria Berushko was still emotional about it after over two decades when a newspaper reached out to comment in 2007, so much so that her mother, Ana Miskalo Berushko, makes no comment on the subject. "This is a story that makes my heart burn." This is how Maria Miskalo responds when questioned about her niece in 2007, Maria Berushko. "She was 27 years old. A very kind person. She loved her students. It's been a while, but it seems to us that the tragedy happened yesterday. My niece gave her life for her students. Seeing the building catch fire, she chose to stay with the children, helping save some, rather than fleeing the flames. She is a martyr, but now our bishop wants to canonize her," celebrates her aunt Maria Miskalo. However, when the question is about the miracles that may have already been performed through her niece, she prefers to be measured. "We have heard from several people who say they have received graces. I believe she may have performed miracles, but all this is stirring too much with our family. I'd rather not say too much," she sums up. According to the Bishop of the Ukrainian Orthodox Church in Brazil, which is under the Ecumenical Patriarchate, Bishop Jeremias Ferens, the intention is to canonize "the Martyr of Joaquim Távora" as soon as possible. "In the Orthodox Church there is no beatification, which speeds up the process of proclaiming someone as a saint. We are sure that Maria Aparecida will be the first Orthodox saint of Latin America. For this, we need to prove the existence of at least two miracles. But we have more than that," he says enthusiastically. According to the Bishop in a 2007 interview, the most exceptional cases of miracles attributed to the teacher from Paraná are from a person cured of an allergy and from a child who mistakenly consumed kerosene and escaped death. He also reports that a dossier with the entire history of the candidate for sainthood is almost ready and, after being discussed at the 11th Synod of the Ukrainian Orthodox Church of South America, which will take place in September, should be sent to the United States Metropolitan. From there, the process goes on to the Patriarchate of the Orthodox Church in Turkey. The final response can take from one to three years. Also, according to the Orthodox Bishop, there is also the intention to arrange for the canonization of the eight students who were victims of the fire. This news surprised the farmer Maria Bileski Marim, who lost her daughter, Alexandra, only seven years old, in the accident. "I do not even know what to say. I am proud to know that my daughter can be a saint." A street in the Brazilian town of Curitiba has already been named after Maria Berushko (rua Maria Aparecida Beruski). According to the historian of Ukrainian emigration in Brazil, Dr. Oksana Borushenko, at the beginning of the 20th century, the name Berushko became Beruski, which is what Maria's name was in Brazil.